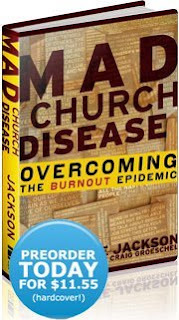 I thought a great name for a book - Mad Church Disease by Anne Jackson. I had the opportunity to meet Anne (Along with hundreds of others - she wouldn't know me from Adam) at a conference earlier this year. "Generally speaking, most people in ministry feel like they have to exhibit a professional spiritual front….we pretend we have it all together when in reality, we’re keeping quiet about the areas we’re struggling in. We feel like we have to have it all together in order to lead, and if we were really honest and maybe even confessed something, we’d lose our jobs or be removed from our positions of leadership. By keeping our junk inside, we’re operating in our own strength (not to mention we’re sinning!) and we disconnect from our relationship with Christ." I have pre-ordered the book from Amazon if you are in any type of Church leadership I suggest you do the same here. We can carry on living life the same with all our fronts and great words or in the words of Anne: "It actually takes getting off your bum and doing something though…there’s no magic pill." Think that could be a manta for so much of the consumeristic mind set that has transitioned from our culture into the church, where we look for an instant formula for everything and if we don't get it we blame someone else - usually the pastor! Now wait a second...I would remember meeting you! Bobby G & Kevin P talked about you and your church all the time when I was @ LC.tv! I know I would remember...I think!...what conference?